The world is getting hotter and just like humans, animals and plants need strategies to cope with rising temperatures. But it’s birds that are especially vulnerable to overheating. 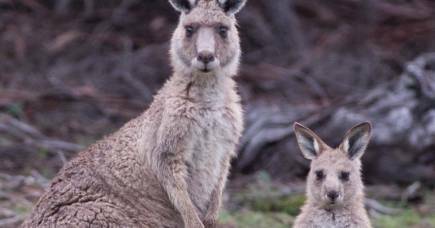 They are small, they have very high metabolic rates and are mostly active during the day. Yet many of them are found in arid regions that in summer can reach temperatures close to 50°C with extremely high solar radiation levels. But now, our research, published in Nature Communications,has found that some birds use a neat trick of the light to keep cool, and we are working towards uncovering the feather nano-structures that makes this trick possible. You are probably familiar with the fact that colours can alter the temperature of a surface. Light colours, like white or yellow, reflect light and as a result absorb less energy than dark colours. Energy absorbed from sunlight is converted into heat, which is why wearing a black t-shirt in a harsh Australian summer is a bad idea. But there is much more to this story, at a very small scale, than meets the eye. The colours that we see are a result of the light reflected within a narrow range of wavelengths – what we call the visible spectrum. But sunlight also spans wavelengths that we cannot see. Humans can’t see ultraviolet wavelengths, which many other animals can see. But there’s one set of wavelengths that elude all of us – these are near infra-red (NIR) wavelengths. And understanding how bird feathers interact with these wavelengths is important, not just for birds, but also for humans through the potential for improvements in thermal efficiency. 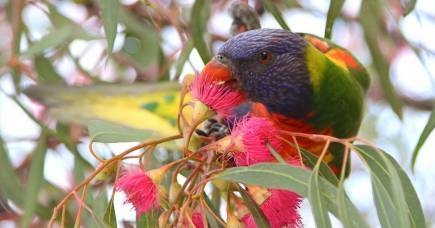 Our research in the School of BioSciences at the University of Melbourne suggests that some Australian birds can control their temperature and avoid overheating by reflecting near-infrared wavelengths of sunlight. 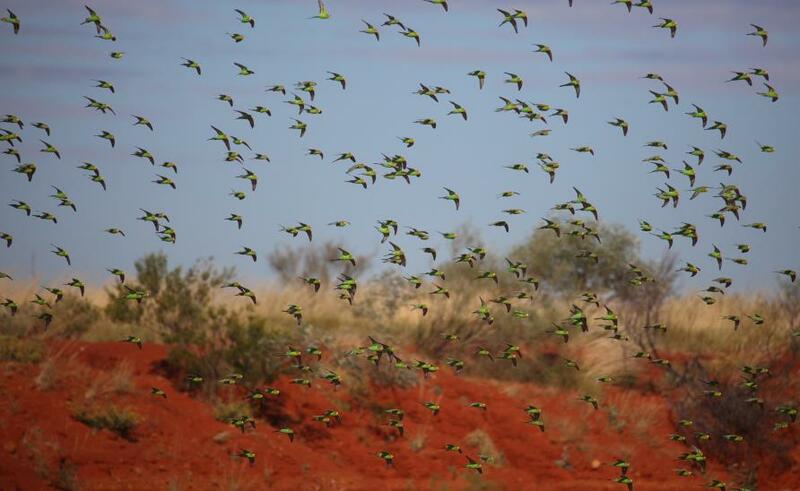 We collected information on 90 species of Australian birds and found a very strong link between living in hot, arid regions and reflecting a higher proportion of near-infrared light. 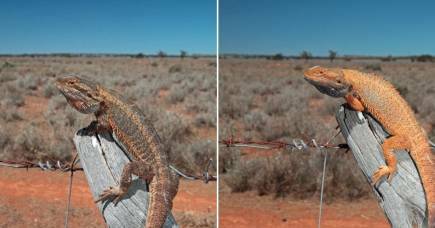 Researchers in the field of animal colouration have largely ignored near-infrared light, because it isn’t easy to measure and there’s no evidence that animals can see these wavelengths. Because these wavelengths are invisible, they don’t affect camouflage or sexual attractiveness, which are very important in the animal world. This means that many animals can control their temperature by altering reflection of near-infrared light without compromising their ability to hide or attract a mate. 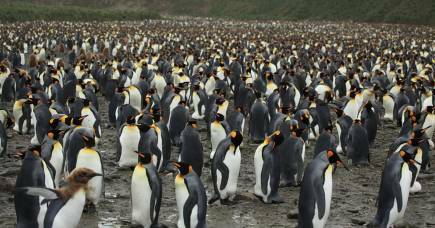 How do penguins find their mate in a sea of tuxedos? The orange chat (Epthianura aurifrons), which lives in the hot and dry area of central Australia, is a good example. Males have a bright orange-yellow crown and breast to impress females, while females are a well-camouflaged mottled grey and brown. Yet both sexes, irrespective of their colour, reflect a remarkably high proportion of near-infrared sunlight – this is particularly noticeable from their crown and back, which is often exposed to the sun. 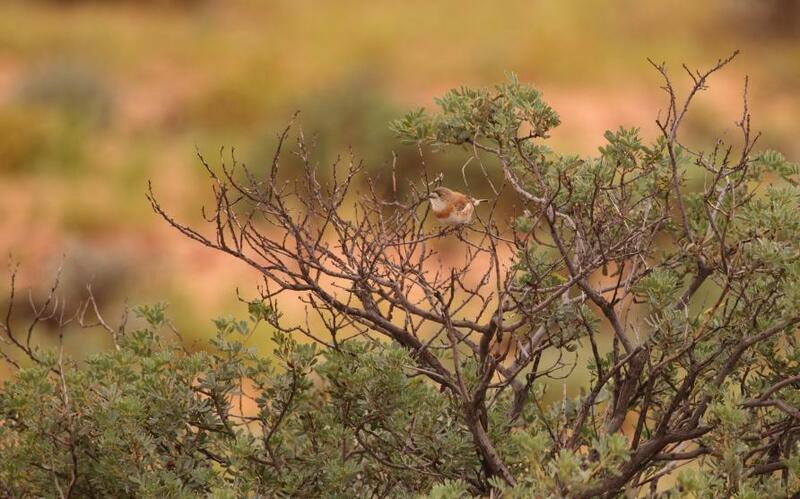 This might allow these small desert birds to forage for longer to get enough food to survive without overheating. 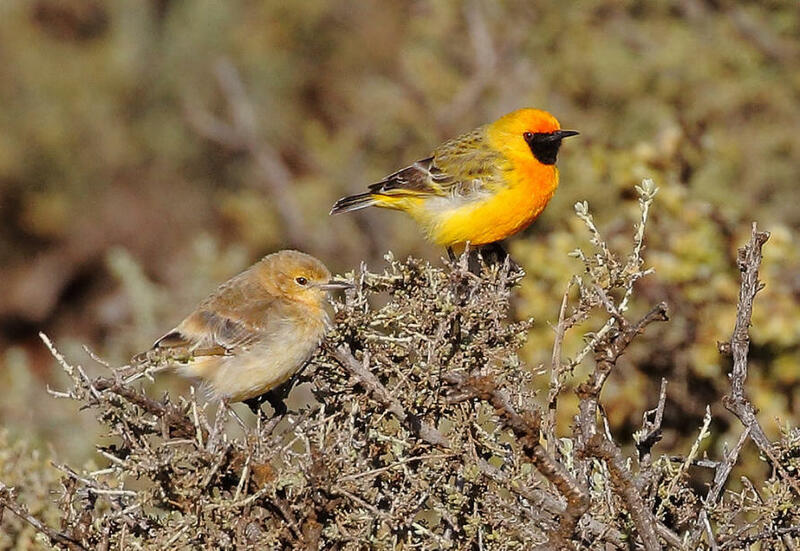 Across the 90 bird species we studied, reflection of near-infrared light correlates with climate, so birds in hot, dry climates, like the orange chat, tend to reflect more of this light. 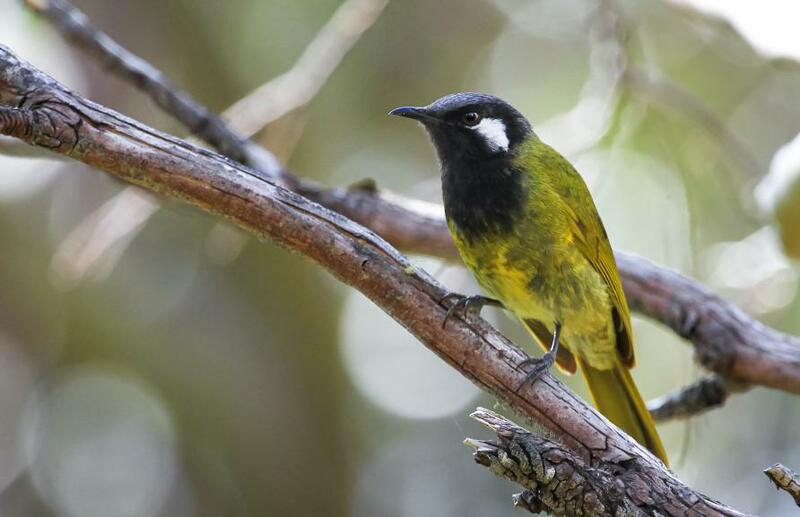 Those in cooler climates, species like the familiar superb fairy wren (Malurus cyaneus), or the white-eared honey eater (Lichenostomus leucotis), tend to absorb more of this light. If we could see infra-red light, the birds from hot climates would have paler feathers than the birds living in cooler climates. Interestingly, only the dorsal feathers – those on the back and head – showed this relationship to climate. The same effect isn’t seen in the ventral feathers on the underside of the bird. This makes sense because the dorsal surfaces are more exposed to direct sunlight. It is further evidence that natural selection has favoured NIR reflectivity and isn’t just a coincidence that’s come about as a side-effect of some other feature of feathers. We also found that small birds had much higher near-infrared reflectivity than large birds. So why small birds, and how much does it actually improve a bird’s chances of survival? To understand this, we developed biophysical models looking into how reflecting near-infrared light benefits the birds through reducing water loss as a result of evaporative cooling. This is the main way birds prevent overheating – like sweating – but the water is mostly lost from the lungs. We fed our model with weather data from the Simpson Desert in South Australia. This extreme environment, which has similar harsh conditions to Arizona in the USA, is home to more than 100 bird species. At temperatures above 40°C , we found that small birds can lose more than ten per cent of their body weight every hour through dehydration. If they don’t have ready access to water, this dehydration could kill them in just a couple of hours. By increasing reflection of near-infrared light, our models suggest that smaller birds (weighing around ten grams) lose up to two per cent less of their body weight per hour. But these benefits are less for larger birds (one kilogram), who save only 0.1 per cent. To put the result for small birds in human terms, a 60 kilogram person would avoid losing 1.2 kilograms of water each hour by having a highly reflective skin. In extreme environments, this could be the difference between life and death. Birds that lose more than ten per cent of their weight from water loss during a day are unlikely to survive. We wanted to know more about how this NIR reflectivity works, so we looked at white feathers from 50 bird species. By focussing on white feathers that have no pigment, we could isolate the specific micro-structures that produce high NIR reflectivity. We found that the feathers that reflect most NIR light, regardless of their visible brightness, are those with barbs – these are branches from the main shaft – that are round rather than flattened and have very closely packed branching filaments or barbules. So, what does this tell us? Well, it’s a step in understanding how birds cope in a warming climate. The next step is to find out if other animals also control their temperature by modifying reflection of near-infrared light – do insects like butterflies do the same? There’s much more to learn by looking into the nanostructures in feathers, or other animal surfaces like butterfly wings, that generate these reflective properties. But it could also have an impact on humans. In the future, by understanding these nanostructures, it could help us develop new materials that enhance energy efficiency in increasingly hot environments – like surface coatings for passive cooling and improved solar energy-capture technology. Penguin colonies can number tens of thousands, so how do penguins hook up and find their families?